I love novels, but I hate their beginnings. The beginning of anything, actually, is tedious. When you learn a certain skill, or begin a project, there’s so much prep work, so much basic training you have to suffer before getting to the good stuff. This is why I hate the beginnings of novels; I have to wade through the sticky sludge of exposition and world-building before the plot shows itself, and before I feel I know the characters. I’m sure this is why editors also hate the beginnings of novels. Oftentimes, editors (and readers) don’t manage to get through them. This is one of the key reasons why writing a novel is hard. I feel every novelist’s pain. If the first chapter is crucial, the following three chapters are more crucial. Over the past two years, I’ve been rewriting no fewer than four novel beginnings. Yes, the novels themselves are getting better, thanks for asking. No, the process of rewriting isn’t getting any easier, damn it. For the sanctity of fiction, I must put out a NOTE TO ALL AUTHORS: I couldn’t care less about the social reject’s problems. Not at first. What I care about is how he feels when his head is in a toilet while he’s getting a swirly. I have an odd aversion to reading any novel when it comes home fresh from the library. Writers, take pity on your readers. We have to stick our heads in your writing and swirl it around until we’re drowning. Make that flush so strong you knock off our glasses with your writing-metaphor-toilet-water, or so articulate the water picks up our glasses and folds them for us. I’ll work on my own writing. No one is perfect, but the beginning of any novel should be worth a try. …Right? Be nice. I understand the work that goes into a novel. I also understand I only write good reviews when I’m bashing someone over the head with it. Every “review” I write for this challenge will be short, sweet, and—I hope—somewhat positive. To your benefit, I don’t stop reading a novel until I find out what, exactly I don’t like about it. This helps me grow as both a reader and a writer! guess the genre: Modern day history drama! pre-read impression: Old objects, suspense, and cops? I’m in. LAST impression: …Or not. I gave up exactly on page 128. The plot was really starting to rev up, but there were a few things I couldn’t get past. First, I wasn’t too invested in the characters. Anderson didn’t spend as much time personally getting to know these people than he did coming up with plot points to get them moving. It wasn’t enough for me to feel as if I, the reader, personally knew these people. Then again, I’m someone who spends way too much time getting to know her characters than she does coming up with things for them to do. There was one character in particular who was trying to hard to be this Strong Female Character everyone is searching for these days (as well they should). She was good enough until two things happened. I’ve just finished reading a different novel in which the female protagonist goes out of her job description to risk her life solving a case because, for some weak reason, she makes it personal. I saw smatterings of that plot device here. On page 128, to be exact. I’d normally let that slide, but it happened soon after I was confused by one of her actions: she went to a meeting without her shoes. Erm…uh… women don’t do that. No matter how “strong,” self-possessed, or confident she is, a woman simply doesn’t step outside, get into a car with her supervisor, and lead a meeting in which she has to convince other people to work with her just because her feet hurt. I give Anderson some slack because he isn’t female. Sometimes writing the opposite gender is difficult. I get that. Of all the objects she left behind because this character was frustrated or in a hurry, I don’t understand why it had to be the shoes. Lastly, there were one too many mentions of “Perry Mason.” This is a minor offence, and a stupid reason for me not to like something, but I have a deep loathing for that show strictly for personal reasons. Despite the above events that turned me off, the writing was exciting enough. stars: 2/4. That’s not bad! Although I didn’t care to finish this book, I would recommend it to anyone over fifty years old or anyone who loves government conspiracy novels. guess the genre: Soap opera set in Shanghai? I’ve seen a few action films from China that were pretty good, so I’m a little excited for this. pre-read impression: A small cast of characters might be puppets to a billionaire. LAST impression: Let’s start with the good points. Like the movies I mentioned above, it was cool to hear/see a language different from what I’m used to. (That’s right, I don’t read many books set in China. I don’t know why.) I had to look up a few locations and words, but I’m not complaining. Aw did a wonderful job putting me in another setting with food, descriptions of strangers, and unfamiliar Asian vocabulary, but it’s where he also lost me; every single one of his characters appeared to be depressed for one reason or another that the most stunning parts of the book weren’t any of the main characters. Every protagonist was a depressed body surveying the landscape. I can’t sink my teeth into a book like that. Why is it general/literary fiction tries to be depressing all the time? This shouldn’t be a breakthrough concept in fiction anymore. 100 pages in, it was evident I wouldn’t finish this novel, just like the last one. I spent 147 pages wondering when the story would begin, and once it did begin I still wasn’t intrigued. stars: 2.5/4. Even though this rating is about the same as above novel’s, this one was still better. The writing was better and that counts for something. I would suggest this book to nearly everyone; my experience with it shouldn’t force others to be down about it. Needless to say they didn’t knock the glasses off my face. But that’s OK. I’m glad I found out what they were about. You should read them yourself! Tell me what you think. My brain will reboot for the next batch of randomly selected books. On to the B authors! pre-read impression: This is technically a third book in a series that seems to feature different protagonists per novel but… Okay. Wow. Murder thriller. Will break the rules for this one. When you work at a library, you see a surprising lot of crappy books. They’re not all bad. At least, I shouldn’t think they are. I could be an incredible book snob if I wanted to. You may or may not have seen examples of that on this very blog. Especially when one works at a library, one becomes used to judging a book by its cover or jacket summary. We have to skim loads of information in order to help others. Only once in a while do we get to pour ourselves into the very items we recommend. 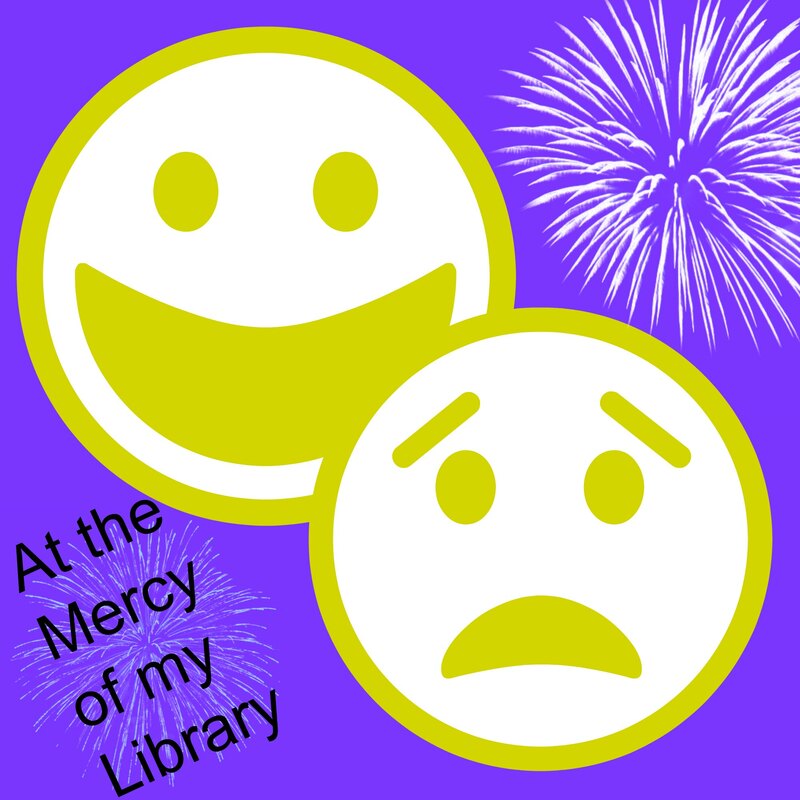 At the Mercy of My Library (A.K.A. the Mercy Challenge)! To make sure my choice is completely random, I have a system. (And what good library employee wouldn’t have a system for everything?) Ideally, every row of books would be equally long. In a busy library, this isn’t always the case. The book I choose will be the second from the right on the longest row of each bay. Allow me to demonstrate with this, ahem, professionally illustrated image. This challenge will start in April and last at least through August. If I end up picking a book that’s not the first in a series, I’ll find the first book on the day I choose these selections. If the first book isn’t in the library, I’ll give myself a break and choose something from the same shelf that interests me. published: Year of first printing. special sticker: Most books have no special sticker. Some, however, indicate Romance, Short Stories, Classic, etc. The following genres you won’t see in this challenge because they’re shelved separate from General Fiction: African American Fiction; Fantasy; Horror; Mysteries; Science Fiction; Westerns. guess the genre: This will be fun. pre-read impression: A simple sentence judging the cover and the book’s summary. Have a taste of authors I’ve selected so far, last names beginning with A.
guess the genre: Soap opera set in Shanghai? I’ve seen a few actiony films from China that were pretty good, so I’m a little excited for this. This is going to be an adventure. Here’s to making it through the whole alphabet without needing alcohol! January is Author Appreciation Month! (Not officially. Just go with it.) Last month, I announced I would spend this AAM on Stephen King. This scene actually represents my thoughts on R.L. Stein. My childhood loves that guy! And so I thought I’d appreciate the more adult version, the version that has many brilliant film adaptions. The thing about Stephen King is that I’ve been curious about him since birth (probably) but have only seen The Shining and more recently Stand By Me. It was time I found out what his writing is about. My choice was Misery because Family Guy‘s adaptation featuring “Stewie Wilkes” intrigued me. It was a pretty good book to start with; as a writer, the main character was easy to relate to. It had a rocky start and a quiet enough ending, but the middle. The middle! In short, it was good. I went in with a forgiving heart thinking King might be close to a pulp writer. Maybe he is. Maybe he isn’t. I give him props in this novel for experimenting with the style. Some pages are the flowered prose of a novel-in-progress written by the main character. Other pages are delusional, dream-like and repetitive. In some pages, the character (probably embodying the writer himself) talks to himself in dialogue, thoughts, and prose. Of course, there are also gory parts. One well-received plus was the inspiration it gave me for one of the novels I’m working on. I’d already developed a specific concept for it, but Misery helped nudged some of the style in the right direction. Dare I say it was a pleasure reading Misery? The rest of my Stephen King reading list is pretty much set, but you’ll have to check back here to find out what I’ve chosen. A little of this, and a little of that. There will be celebrity guest appearances (made you look), one or two movies, and something published after 1990. I’ll be back with more in February, babies! Hi-diddly-ho there, bloggerinos! (Bloggians? Bloggerites? Bloggessians?) I’m back with a vengeance—for books! But I love these challenges. It makes the need to read every book in the world less daunting, and gives a little method to my madness. It gives me something to plan and look forward to outside the writing of my own novels, which everyone will be forced to read and report on within their own blogs. With or without the constant spamming of my fictional adventures, I’d like to update you now on my current challenges. Three are coming up, starting in January, and I can’t wait to tell you about them. Without further Ado, I announce the next three reading challenges for which you can join me! I’ll resurrect Manga Month and add all graphic novels in general. Why? Because Batman, that’s why! This year’s manga will probably be strictly from the more adult section of my local library. I call this one “At the Mercy of My Library.” It’s a half-year of something I can’t even define yet. It’s super top-secret for now, but I can tell you it involves 45 books of randomness and probably some torture at the hands of general fiction. I can’t wait for the Mercy Challenge. Yeah, that’s a good name for it. I depart for now, fellow readers, and pare down my fluctuating, though somehow always expanding, pile of material.